NAHB conducts an annual census of its builder and associate members in order to better understand the composition and characteristics of its membership. The census collects company as well as demographic information. This blog entry summarizes findings from the 2013 Builder member census, with a more extensive article available here. A later entry will summarize findings from the 2013 Associate member census. 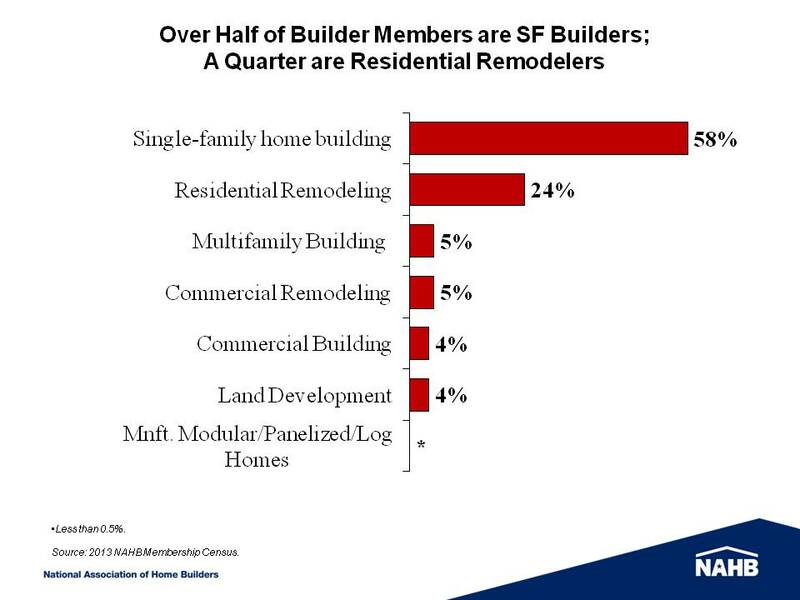 Over half of NAHB’s builder members in 2013 were single-family builders (58%), and about a quarter were residential remodelers (24%). Far smaller shares were involved with multifamily building or commercial remodeling (5% each), and commercial building or land development (4% each). Less than half of 1% were manufacturers of modular/panelized/log homes. 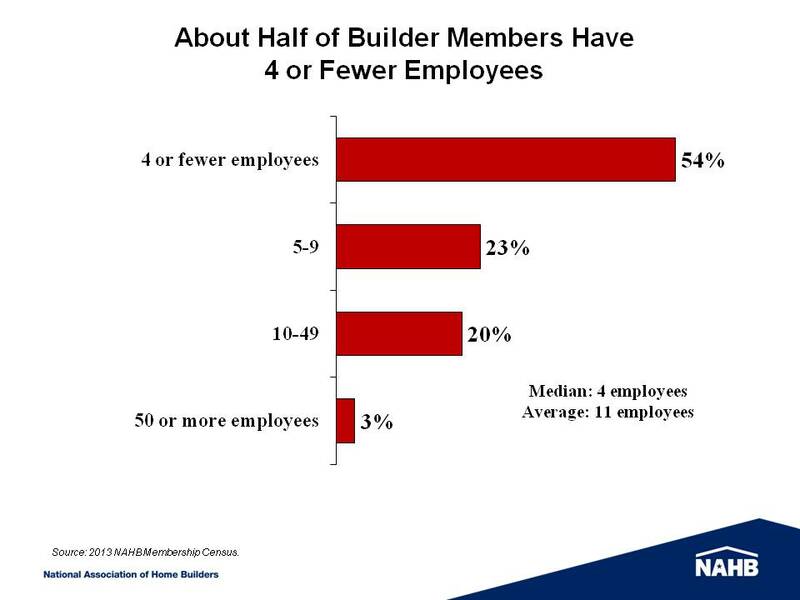 About half of builder members had 4 or fewer employees in 2013 (54%). The median number of employees was 4 and the average 11. Only 3 percent of builder members reported having 50 employees or more. In 2013, builders started an average of 43 units (up from 30 units in 2012), while the median number of units started rose to 5 (from 4 in 2012). The majority (60%) of builders started between 1 and 10 units, while only 8% started 100 units or more. Median revenue among builder members rose to $1.8 million in 2013, a 65% increase compared to 2012. From 2008 to 2011, builders’ median revenue remained largely unchanged at around $900,000. The median builder is 56 years old; the vast majority are male (93%), White (97%), and non-Hispanic/Latino (98%). 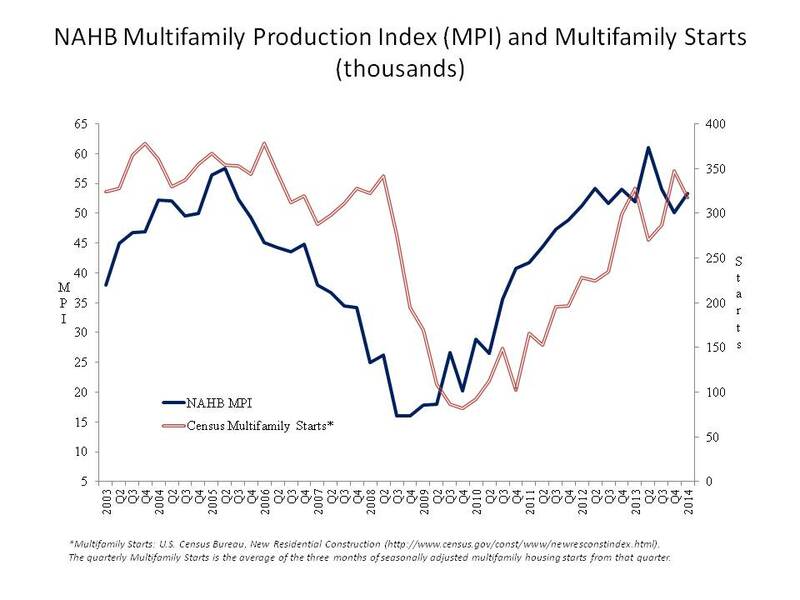 The NAHB Multifamily Production Index (MPI) increased three points to 53 in the first quarter of 2014, which is the ninth consecutive quarter with a reading of 50 or above. The MPI provides a composite measure of three key elements of the multifamily housing market: construction of low-rent units, market-rate rental units and “for-sale” units, or condominiums. The MPI component tracking builder and developer perceptions of low-rent units increased one point to 48 and for-sale units jumped eight points to 54. Meanwhile, the index tracking market-rate rental properties slipped one point to 59, but has remained consistently above 50 since the fourth quarter of 2010. The MPI shows stable production of apartment units in 2014, which is in line with NAHB’s expectation of a 6 percent increase in multifamily starts this year. 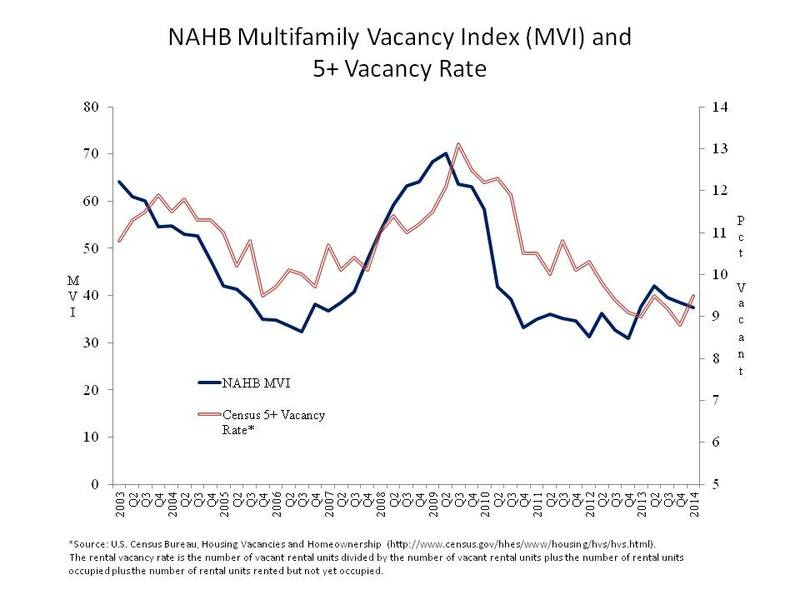 The Multifamily Vacancy Index (MVI), which measures the multifamily housing industry’s perception of vacancies, dropped one point to 37. With the MVI, lower numbers indicate fewer vacancies. The MVI improved consistently through 2010 and has been at a fairly moderate level since 2011 after peaking at 70 in the second quarter of 2009. Previous posts highlighting findings from the study What Home Buyers Really Want: Ethnic Preferences have shown how housing preferences may – or may not – be affected by the racial background of the home buyer. 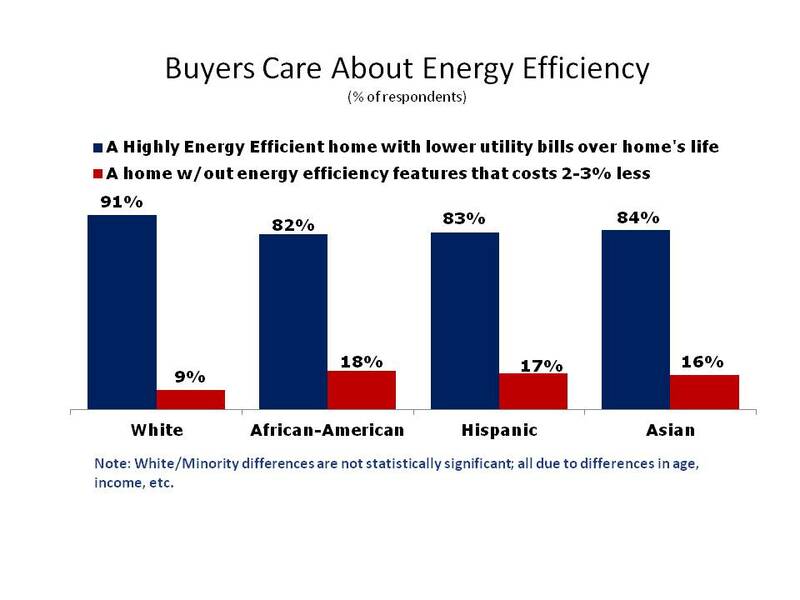 One aspect of the home where race/ethnicity does not play a significant role is energy efficiency – a top priority across the board for all groups analyzed. 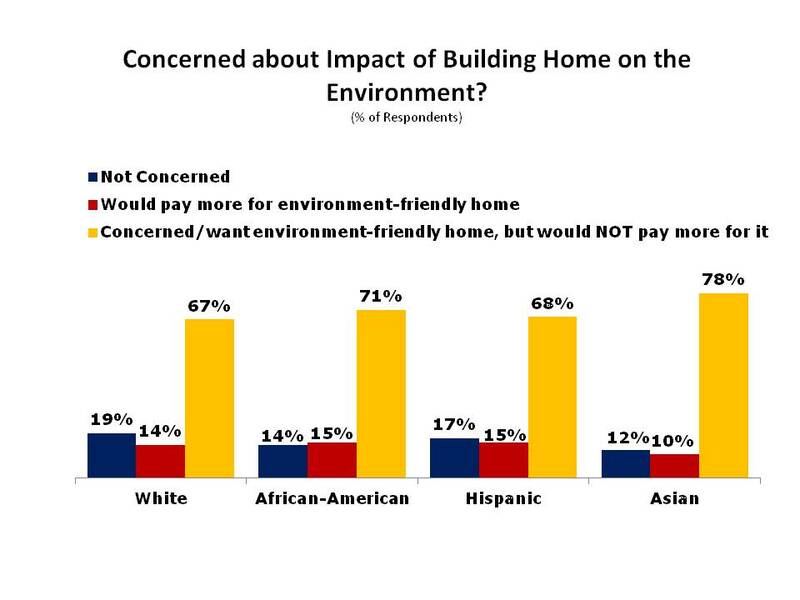 Data in the graph below show that buyers of all backgrounds will not really be moved to pay more money for a home simply to help the environment in some broad and vague sense: over 65 percent of all groups report wanting an “environment-friendly” home, but are not willing to pay more for it. Only small minorities of 15 percent or less would actually pay more just to be friendly to the environment. However, when the question is phrased more specifically in terms of energy efficiency, and the impact that such features can have on utility bills, home buyers show they care a lot. When faced with a trade-off choice between having a highly energy efficient home with lower utility bills over the life of the home vs. one without those features that costs 2% to 3% less, over 80 percent of buyers of all backgrounds prefer the more expensive home that includes the energy saving features. Further evidence of this strong desire for energy efficiency is found in the graph below. Home buyers were asked how important a consideration it would be to have low utility costs when choosing their next home. 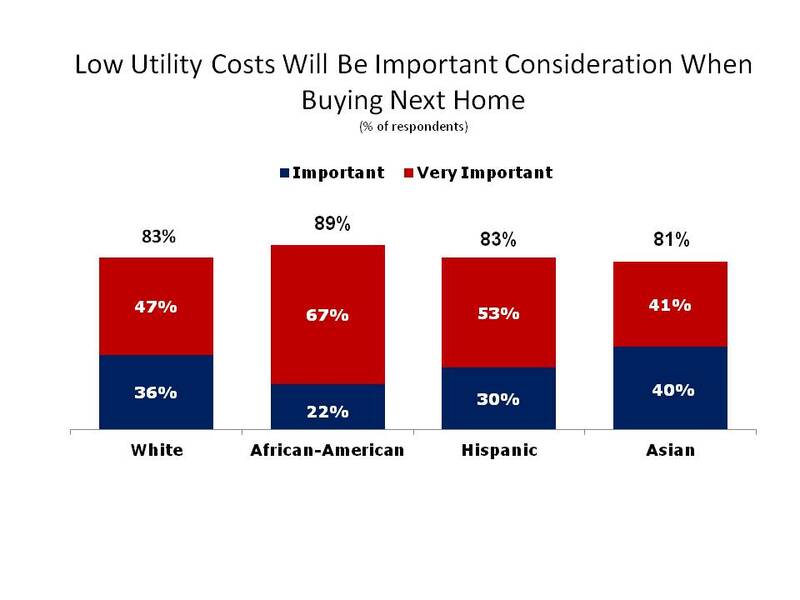 Strong majorities of White, African-American, Hispanic, and Asians buyers (over 80 percent) agree that low utility costs will be important to very important when making that decision. Knowing that buyers are willing to pay for energy efficiency features so long as that translates into lower utility bills leads to the question of how much more are buyers willing to pay, beyond the original price of the home, in order to save say $1,000 a year in utility costs? The answer is an average of $6,774 among White buyers, $7,578 among African-American buyers, $9,146 among Hispanic buyers, and $8,251 among Asian buyers. The latter amounts suggest buyers expect fairly steep rates of return for the money they invest in energy efficiency – somewhere between 10.9 percent and 14.8 percent. 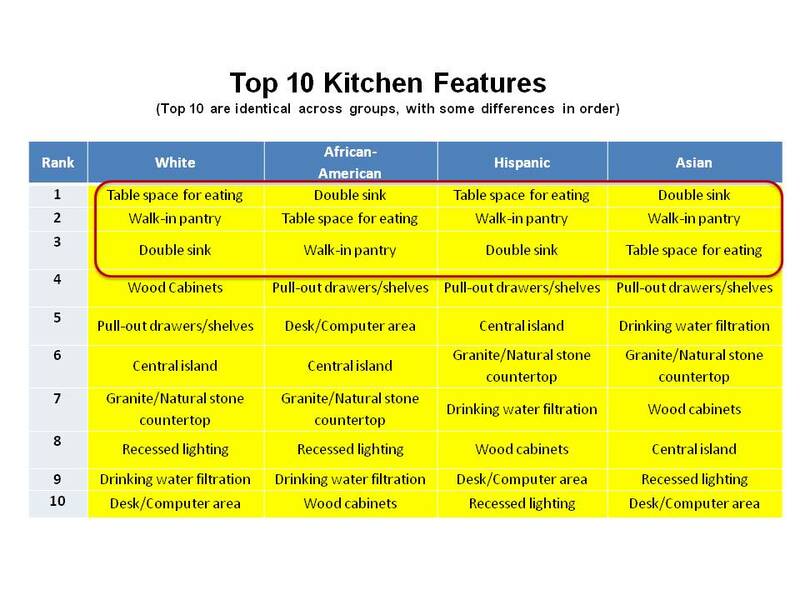 Other features that appear in all four groups’ ‘most wanted’ kitchen lists include a central island, granite countertops, recessed lighting and a desk/computer area. 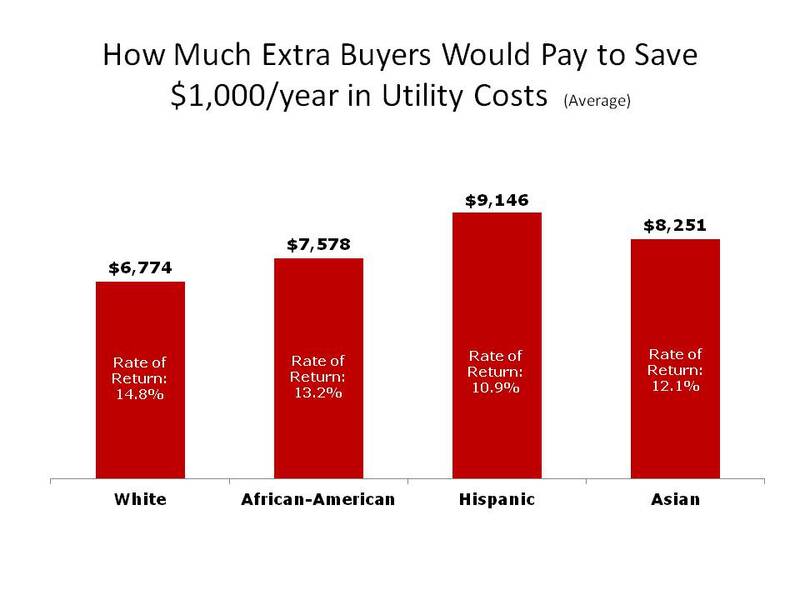 The next and final post on this series based on the study What Home Buyers Really Want: Ethnic Preferences will report on buyers’ attitudes toward the environment and their willingness to pay more for a home that saves them $1,000 a year in utility costs. Findings from the latest NAHB study on housing preferences, What Home Buyers Really Want: Ethnic Preferences, show there are both similarities and differences in what home buyers of different racial/ethnic backgrounds most want to have in their homes. 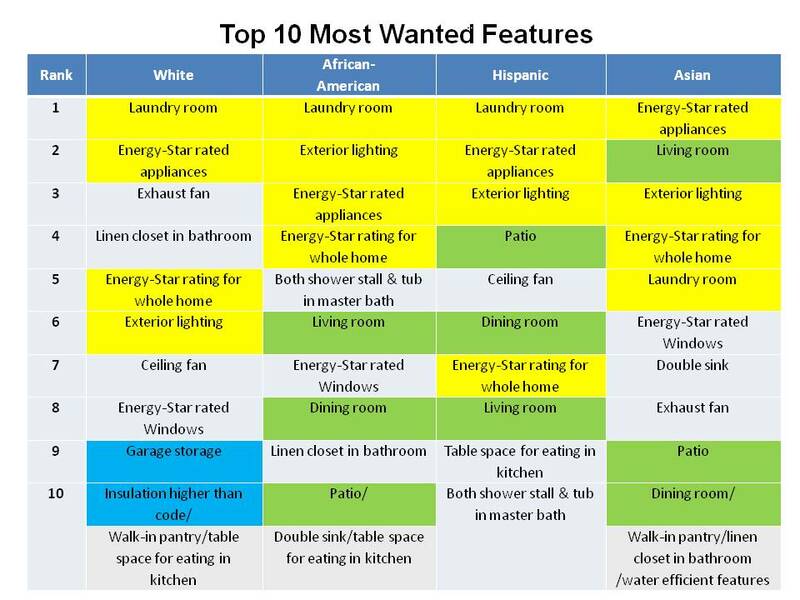 Based on an extensive list of more than 120 home and community features that buyers rated as essential, desirable, indifferent, or ‘do not want’, the table below shows the top 10 most wanted features for White, African-American, Hispanic, and Asian buyers. A laundry room – the single-most wanted feature for all groups, except Asians who rank it 5th most wanted. When building homes, it is as critical to understand which features home buyers really want, as it is to know which ones they do not want and will probably not pay for. 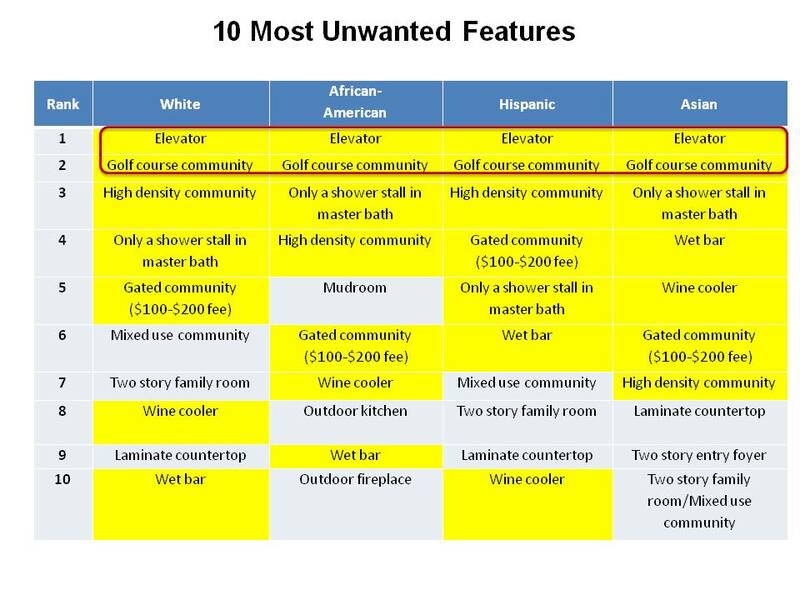 The table below shows the 10 most ‘unwanted’ features (out of the 120+ home and community features listed) for each of the racial/ethnic groups analyzed in the study. 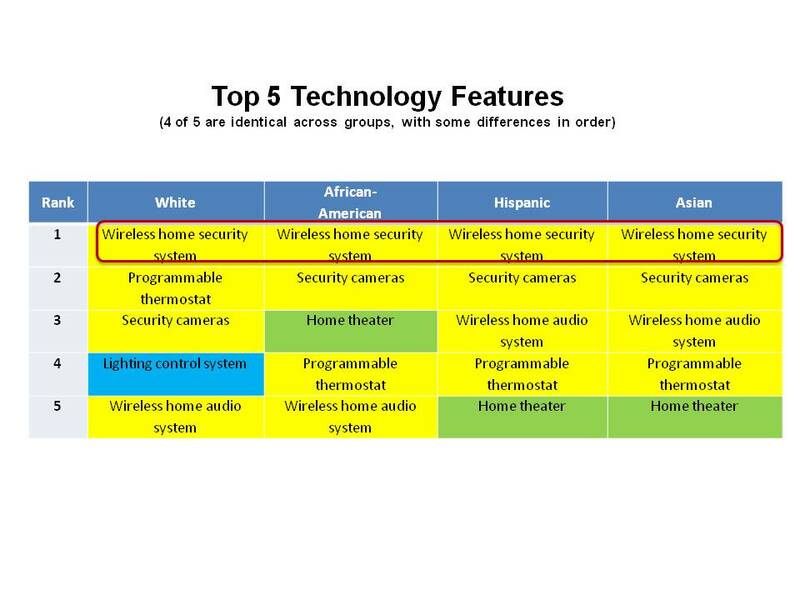 Other features on this table, such as laminate countertops in the kitchen and a two-story family room, are among the 10 most unwanted features of three out of the four racial/ethnic groups analyzed. 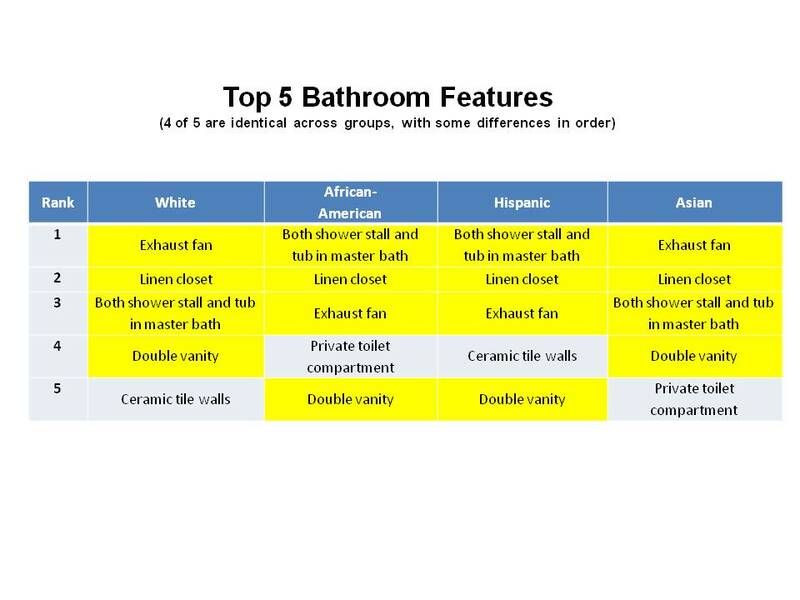 The next post on this series based on the study What Home Buyers Really Want: Ethnic Preferences will cover the specific kitchen, bathroom, and technology features most wanted by buyers of different racial/ethnic backgrounds. Minority home buyers are younger than White (non-Hispanic) buyers: the median African-American buyer is 39 years old, the median Hispanic buyer is 37, and the median Asian buyer is 36. 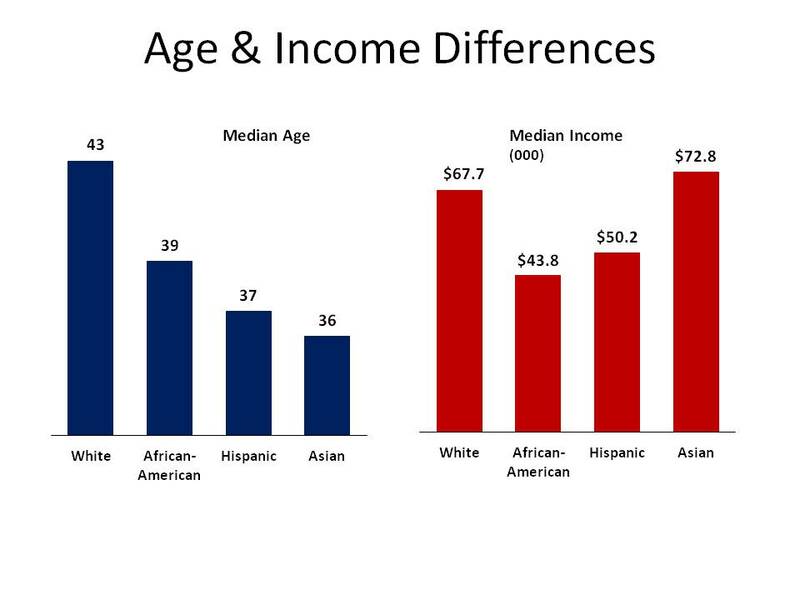 The median White buyer is 43 years old. Asian home buyers have the highest median household income of all four groups, $72,797, compared with $67,747 for Whites, $50,221 for Hispanics, and $43,774 for African-Americans. Asians also expect to pay the most for their next home: $283,469, compared with $205,775 among Whites, $181,444 among Hispanics, and $176,397 among African-Americans. So what are some of the differences/similarities among these groups in terms of housing preferences? After controlling for age, income, and household type, survey findings show that Hispanics and African-Americans want more bedrooms. In fact, 51 percent of Hispanics and 49 percent of African-Americans report wanting to have at least 4 bedrooms in their home, compared to 44 percent among Asians and 36 percent among White buyers. 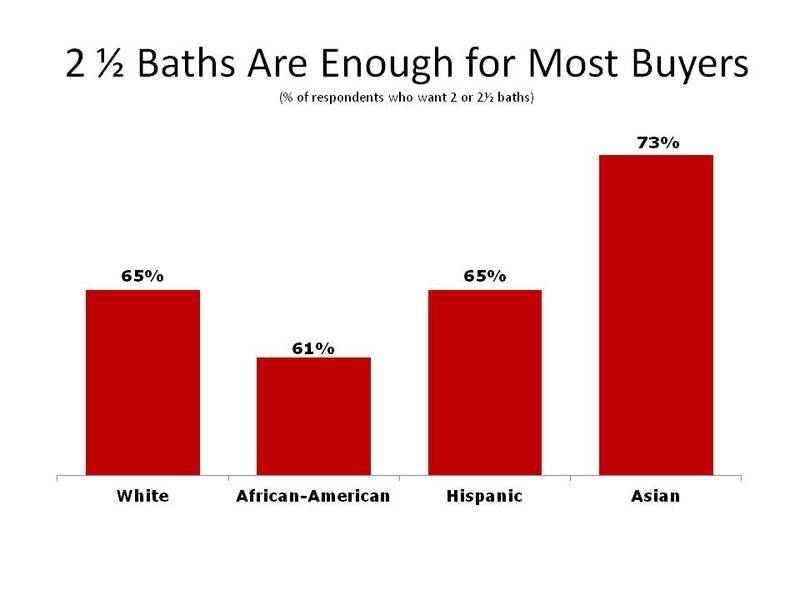 A majority of buyers in all four racial/ethnic groups, however, will be satisfied with up to 2½ baths: 73 percent of Asians, 65 percent of both White and Hispanic buyers, and 61 percent of African-Americans. 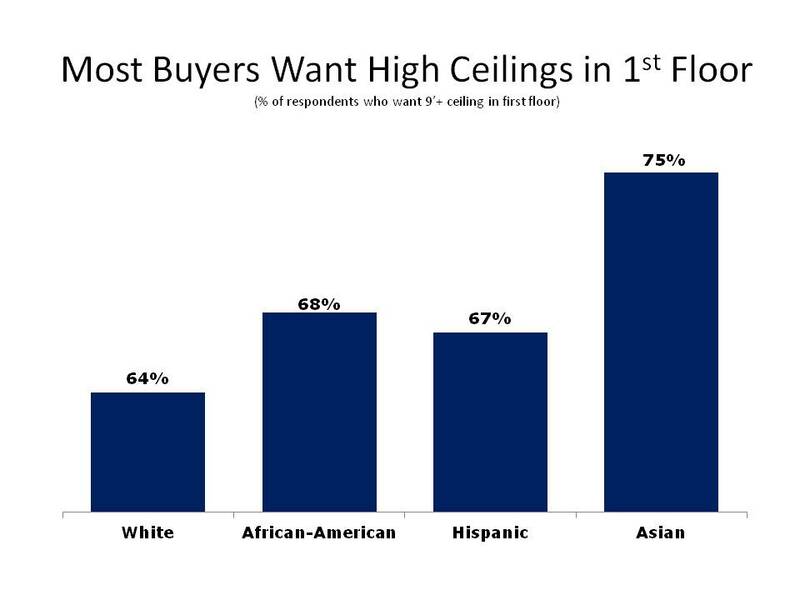 Similarly, most buyers in all four groups prefer high ceilings (9 feet or more) in the first floor of their home: 75 percent of Asians, 68 percent of African-Americans, 67 percent of Hispanics, and 64 percent of White buyers. Placing the washer and dryer in the first floor of the home is a good bet, as buyers of all backgrounds strongly prefer this location for the laundry equipment: 76 percent of Whites, 51 percent of African-Americans, 50 percent of Hispanics, and 46 percent of Asians. 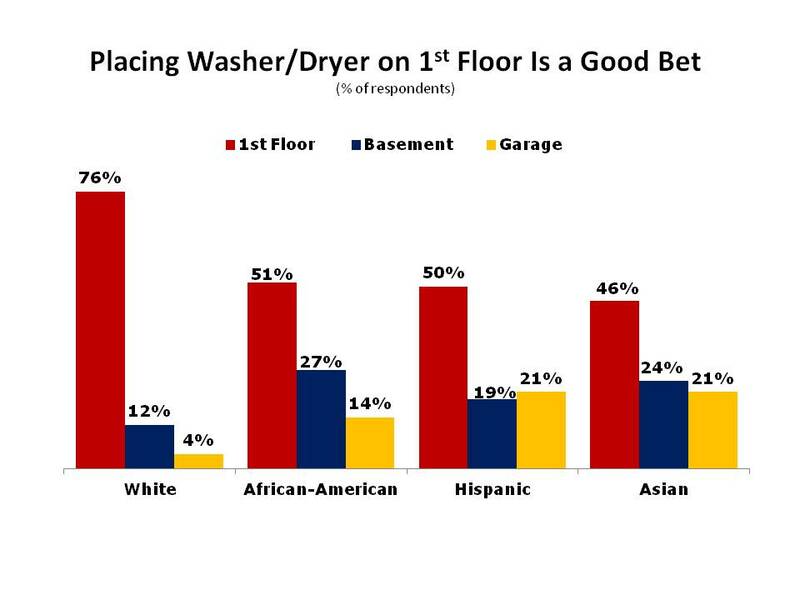 The basement and garage are the second and third choice for about 20 percent of both Hispanics and Asians, significantly more than the share of White buyers who want to do laundry in either of these locations. The 2-car garage is the most popular parking facility across all groups, preferred by more than 50 percent of White, African-American, and Asian buyers as well as 47 percent of Hispanic buyers. 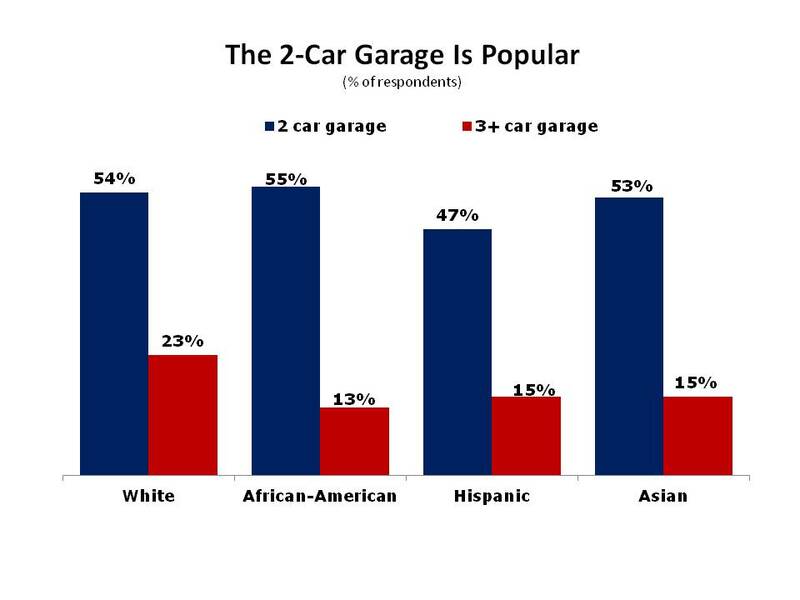 A garage for 3 cars or more has far fewer fans, especially among minorities. This blog post is the first in a series that will release findings from What Home Buyers Really Want: Ethnic Preferences, covering topics such as the specific home and community features most wanted by buyers of different racial/ethnic backgrounds. Knowing what your competition is up to is a must in any industry. In residential construction, that includes having a clear picture of what other builders are putting in their new homes. 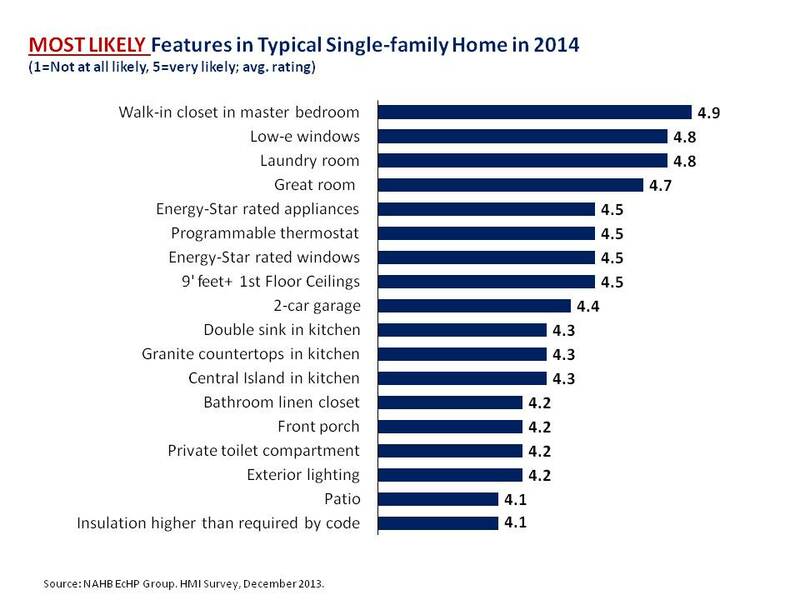 In December 2013, a nationwide survey asked builders about the likelihood that a number of features would be included in the typical single-family home they will build this year. Also likely are a number of energy efficiency features: Energy-star rated appliances and windows, a programmable thermostat, and insulation higher than required by code. 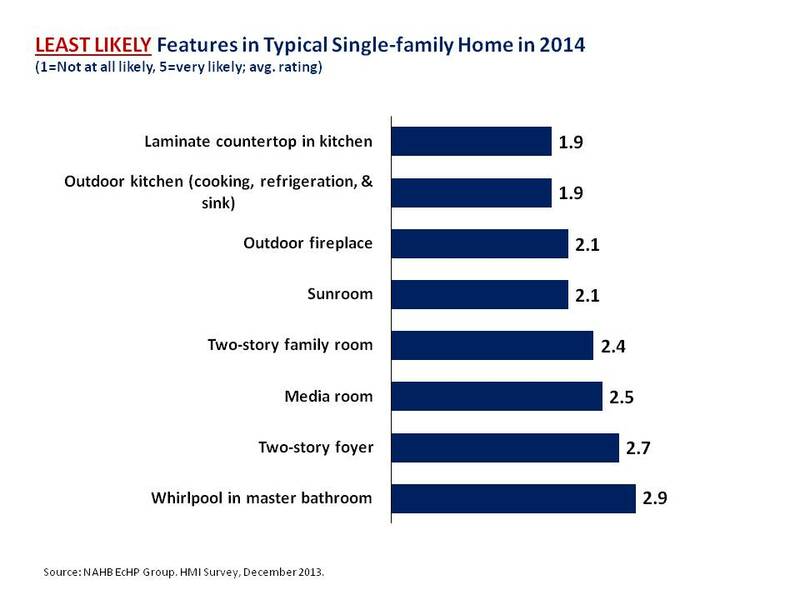 In the kitchen, a double sink, granite countertops, and a central island are highly likely to make the cut. A few outdoor features are likely candidates as well: a front porch, outdoor lighting, and a patio. Two-story spaces (family room and foyer) also seem to be unlikely features, as well as an outdoor fireplace, a sunroom, a media room, and a whirlpool in the master bathroom.